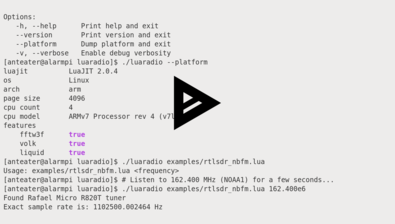 This example is a Narrowband FM radio receiver. It can be used to listen to NOAA weather radio in the US, amateur radio operators, analog police and emergency services, and more, on the VHF and UHF bands. 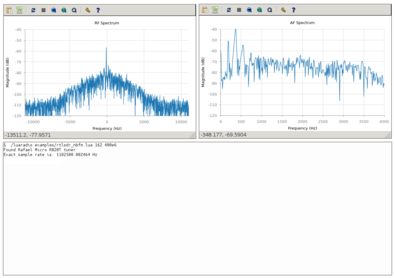 It uses the RTL-SDR as an SDR source, plays audio with PulseAudio, and shows two real-time plots: the RF spectrum and the demodulated audio spectrum. This NBFM demodulator composition is available in LuaRadio as the NBFMDemodulator block. Running this example in a headless environment will inhibit plotting and record audio to the WAV file nbfm.wav. Additional NOAA weather radio station frequencies: 162.400 MHz (NOAA1), 162.425 MHz (NOAA2), 162.450 MHz (NOAA3), 162.475 MHz (NOAA4), 162.500 MHz (NOAA5), 162.525 MHz (NOAA6), 162.550 MHz (NOAA7).